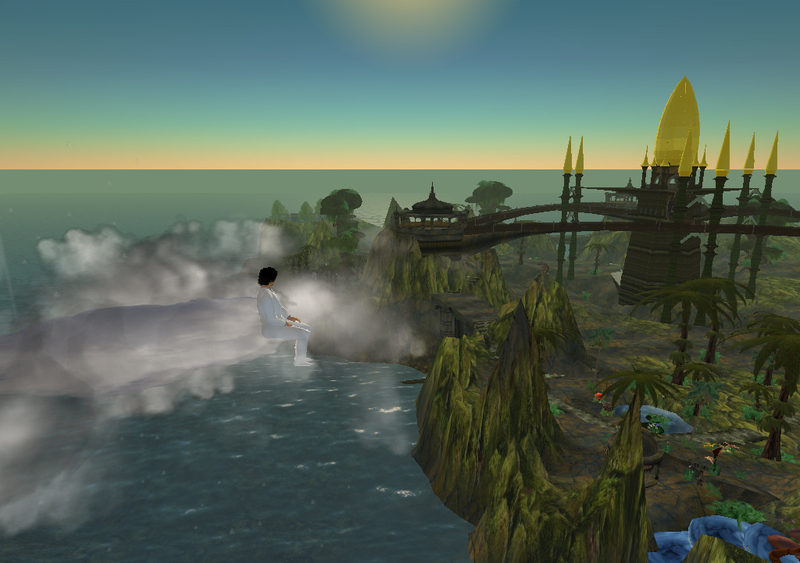 In the beginning, Linden Lab created the heavens and the earth, but the sky was empty and the land was barren. The trees were green but did not grow, the sun and wind passed overhead but did not affect them. Then Laukosargas Svarog came upon this and said, Come, let us make clouds so that they can be borne upon the wind. She did, and it was good. Then Laukosargas said, Let these clouds cast rain upon the ground, and where the land is marshy, let marshy flowers bloom, and where the land is open, let open flowers bloom. And let the sun shine upon these, and where the sun shines brightest, let them grow more, and where it shines least, let them lay fallow. This she also did, and it was good. Seeing this, Laukosargas said, Let bees fly amongst these flowers to pass their seed between each other, and thus be fruitful and multiply. Then she said, Let there be birds to feast upon the seeds, lest these flowers be too fruitful and multiplicitous. This she did as well, and it was likewise good. Then her computer crashed. And that was not so good. "My main machine has blown up!" Laukosargas announced shortly after giving me a tour of the miniature world she created. 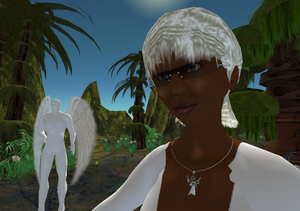 And since her replacement computer was too slow to meaningfully interact in Second Life, the goddess had to put her creation on pause for awhile. 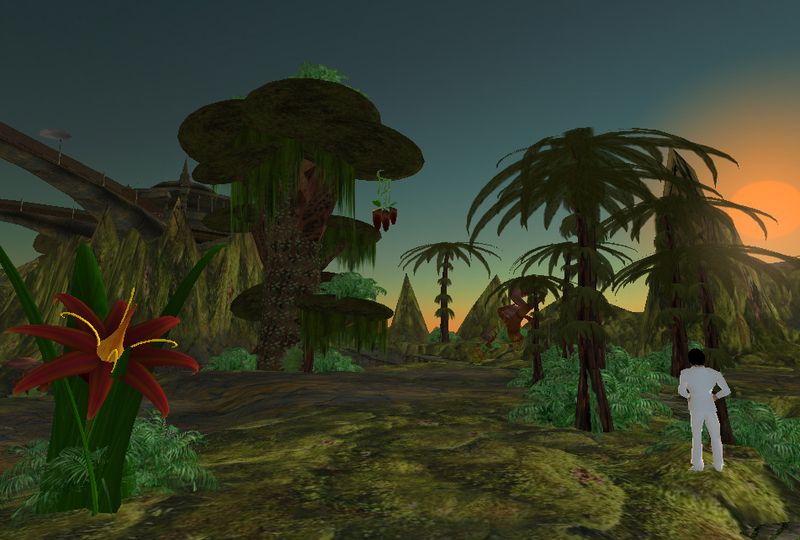 The result of a year's work, Laukosargas Svarog's island of Svarga (direct portal here) is a fully-functioning ecosystem, adding life or something like it to the verdant-looking but arid pallette Linden Lab offers with its world. It begins with her artificial clouds, which are pushed along by Linden's internal wind system. "If I was to turn off the clouds the whole system would die in about six hours," she tells me. "Turn off the bees and [the plants stop] growing, because nothing gets pollinated. And it's the transfer of pollen that signals the plants to drop seeds. The seeds blow in the wind, and if they land on good ground according to different rules for each species, they grow when they receive rain water from the clouds. It's all interdependent." 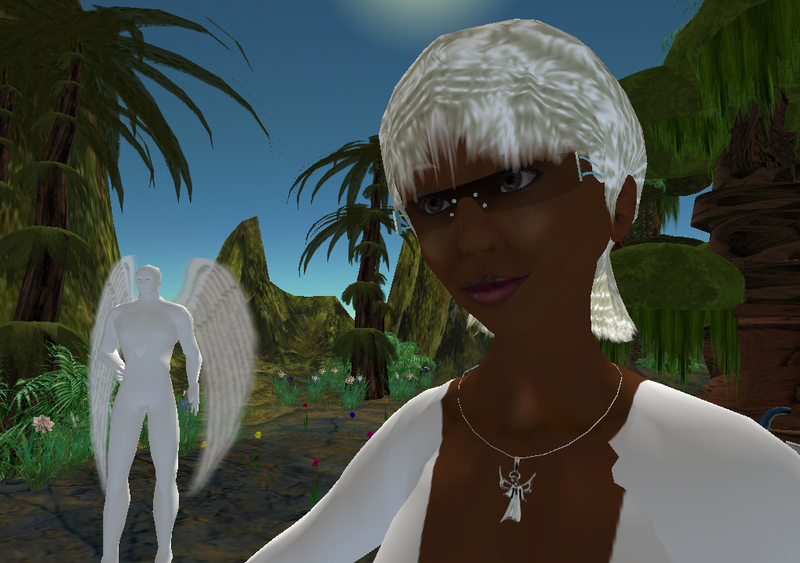 Looking more like an African princess than a deity, Laukosargas and one of her angels met me by a small campfire site in Svarga, and explained some of the inner workings of her world, and what drove her to create it. A two decade veteran of the UK music and game industry, Laukosargas recently left work for family reasons, mostly. "The main reason I stopped is because I had a child," as she puts it, "but I was also getting very disapointed with the lack of inspired work in the games industy." As it happens, she worked for a time on Black & White, the classic "god game" from legendary British designer Peter Molyneux. "It was an experience that gave me a real insight into how great games can be," she says. "It was a truly brilliant idea but it lacked play testing, I think." She's referring to the constant micromanagement required by the player, acting as a tribe's god, to provide a steady stream of resources to survive on. "It required TOO much attention." She nods to her island. "It's a balance I'm still working on here." 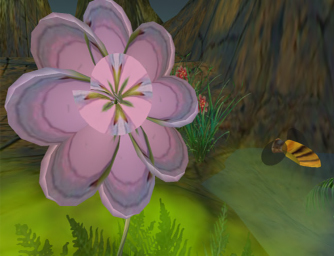 So while she raises a child at home, she takes creative respites to nuture a self-sustaining ecology in Second Life*, adjusting variables here and there, working for the moment when she can stand back like Newton's clockmaking God and let her world unfold on its own. And, well, have her Sunday of rest. Even this early into its creation, she's noticed some limited forms of emergence (the holy grail of artificial life developers) particularly in the development of her plant life. "It's very sensitive to very small changes," she says, "like if a gene emerges which gives a plant an extra seed in its lifetime, that can cause huge growth in its locale. And the opposite of course, one less causes thinning growth. I've also seen the same color become a dominant gene so all the meadow cup plants became blue once. Simple things like that emerge quite often." All this sounds like an invaluable experiment in artificial life or testing theories on evolutionary development, so I ask if she's interested in finding out anything from Svarga. "Yeah," she answers, "Is it fun? I'm totally uninterested in all the hypothetical bollox that gets spouted by academics." "I love it-- for fun, you play god. Everyone needs a hobby." "I am god," she agrees, laughing. Nearly all of the plant-life in this area of the sim is part of a beta test for a fully functional artificial ecology system for Second Life. Everything is actually growing and replicating by itself! Scripted clouds roam the sim and occasionally rain onto the ground below. The plant-life underneath soaks up water from the cloud, the amount is determined by angle and distance. Wandering lonely on a cloud. "They blow around the sim using the SL wind," says Laukosargas. "They cover the whole sim several times a day." The SL sun provides energy for growth, it's measured by it's position and the amount of SL cloud density. Little tiny scripted bees fly between fertile flowers distributing "pollen" which contains "genes" describing the plant it belongs too. If a plant receives pollen from another of the same species it produces a seed or a sprout which becomes another independent plant. Birds fly around. Mostly pestering visitors for food in the form of seed that you can buy at the seed vendors. But occasionally the birds get hungry and will come down to eat flower seeds or seedlings they find on the ground. This helps keep the system growth in check. Very occasionally you might catch a bird chasing a bee too ! Trees are grow from seeds to mature. When they mature they become fertile and occasionally flower. Flowers are pollinated by bees and then seed. Tree seeds blow in the wind and if they land on fertile ground will slowly grow into another tree. The various types of flowers grow from seed and are pollinated by the bees. Each flower species requires a different kind of habitat. Eg some only grow under trees or in "shady" places. Others only grow out in the open. Others require wet areas. Invisible markers designate habitat areas such as "shady", "boggy", "wet" etc. Some plants can only grow in a certain place and they use these markers to find the places. Although currently they have little to do with the eco system, at night bats come out and chase the globugs to provide a little entertainment. This system is so complex it can grow and take over just like mother nature in real life! It requires a some tending, pruning and sometimes a little watering too. The autoverse is upon us. Greg Egan would be proud. A visit to Svarga is long overdue. Thanks everyone, especially Hamlet for such a great mix of fact and humour! This has to be one of the most creative things I have heard about yet in SL. I cannot wait to visit your island! Thanks Hamlet, great work! I can't wait to log in and check it out tonight. Someone achieved what I had only started dreaming of little over a year ago when I started aLife and experimenting with emergent life patterns. A long time ago I had Sim-Life, and it was fun, and I've been wondering when someone would take something like that to the next level. At the same time, this type of thing makes me wonder how close "The Matrix" and "The Thirteenth Floor" are to our own universe. It messes with my mind man! 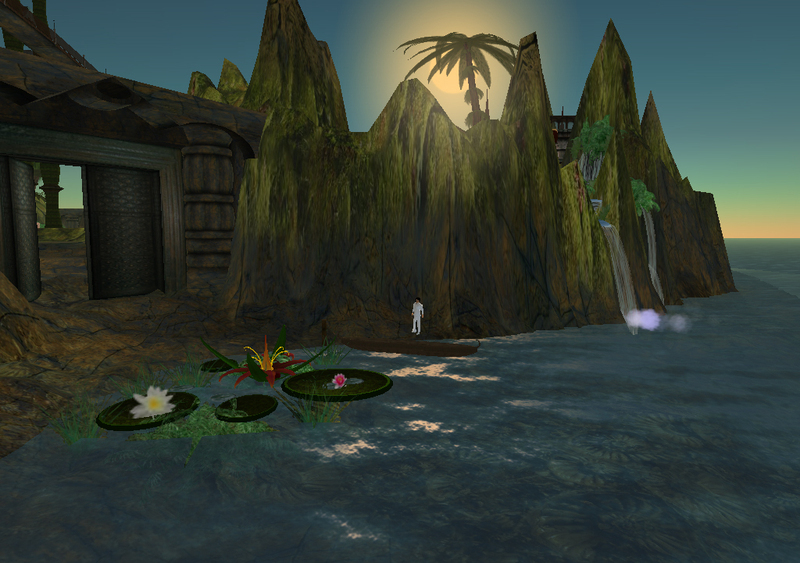 lauk is one of my favorite builders in SL. I was in svarga last week admiring the sheer beauty of the place. I had no idea of the true scale of what she is working on. Very very cool. So glad you blogged this, Hamlet. This is a great example of what SL is truly capable of. Lionhead Studios should re-hire you and quadrouple your salary! Lauk is a genius. And her early stuff at Orwood Castle and Lauk's nest is what helped inspire me to try and do this sort of thing myself. We're still in the development stage at Terminus, just a few critters, but we've got a decent API for all alife interactions thanks to user Never Rust, who apparently has Lauk to thank for some converations regarding critter-on-critter interaction. Lauk's work is a testament to what one can achieve in SL. It's soooo pretty there. Lauk gives great tours. A lot of times when I see "experiments", they look pretty raw--but this has tons of organic polish. You can almost feel the dirt under your avatar's fingernails! I had a chance to visit Svarga after seeing it mentioned on Slog. I had no idea at the time there was a blossoming ecosystem. Even if that were absent, Svarga would still merit a visit. It's surely one of the most uniquely and gorgeously designed regions in the SL world. Go, Lauk! Not just for your incredible SL work, but for you and your little love! Go, girl, go!---yer bud, Hens. wow! really impressed at this. Wow, incredibly beautiful. Great work on this. SL gives you the tools other online games do not. You can do pretty much anything you can imagine. To make matters sweeter, there is no monthly fee. re: lauk's comment: i think trying something and then figuring out why it doesn't work is a _wonderful_ way to learn things! imagine how many students there are in the world who are told by a teacher, for example, that you can't write an algorithm which decides for a given turing machine with given programming whether the machine will ever halt. surely every once in a while a student thinks, but i've got an idea for such an algorithm! those, of course, haven't understood the problem fully, yet. but after they tried to actually solve the problem and analyzed why they must have failed, they do understand it. and sometimes, with some problems, they even prove the teacher wrong and make a wonderful discovery. i'm all for trial and error -- it may not be the best software engineering method, but it's tightly linked with learning. And once again thank you to everyone who has been around Svargo to see the project. I'm totally amazed at the level of interest this has generated ! i was just ther a little bit ago and was SUPER impressed.. this is the type of thing i used to imagine for the future of SL. it's great to see more and more of this being done. i'm suprised nobody has mentioned the music you have playing there.. it feels like organic, ambient/IDM and SO perfectly fits the scenery! Incredibly beautiful. Really amazing. Great work! 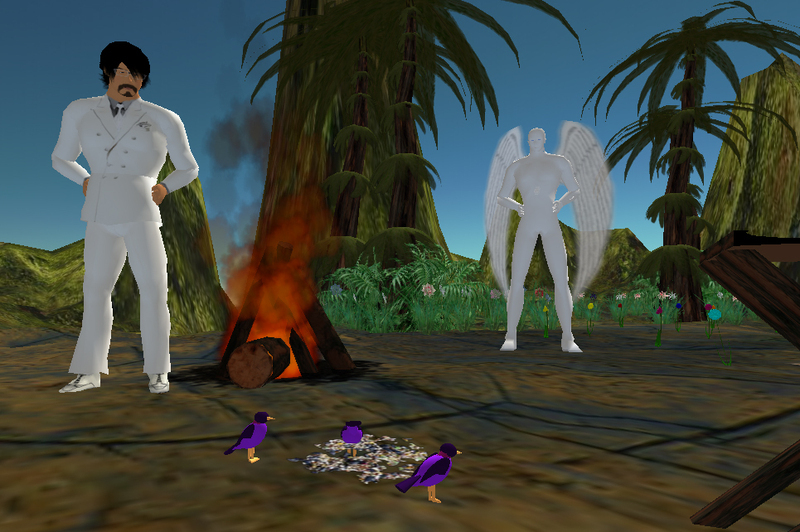 This is the opinion of three people, we visited Svarga in SL together. It surely has been my best experience in SL. 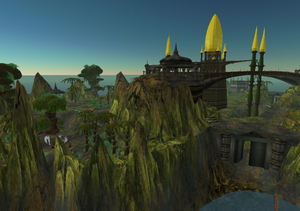 I am working on a 5 acre VR park --which I expect will include Svarga. I appologize if you get too many emails but could you fil me in on the current specs? I am interested in the application as a walkaround VR and so would need "head tracking" for "terrain following". I presume you would be aware of the latest eyewear as well. Visitors will probabily wear a 'wireless belt' of some kind. But I'd like to know what you recomend. I am told that the newer HMDs will have saccade correction software as well as high definition. I hope to combine this with other custom software but would like to showcase existing work. My favorite spot in SL, I've recommended it to dozens of people. I'm a rhythm nut, and the drum circle and vocal circle are lovely. The ever-changing garden in the SW corner is sooo peaceful, but would you consider taking down the artificial walls. They are a tad cheezy, I think. Not to complain. Thanks for you beautiful creation.